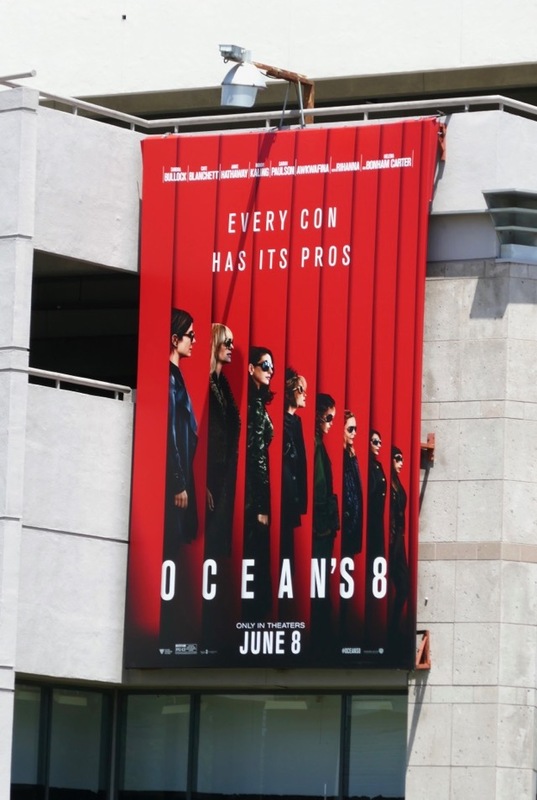 This summer Earth's mightiest heroes assemble, no wait that's already happened, Earth's mightiest con artists assemble to pull off the heist of the century in Ocean's 8. 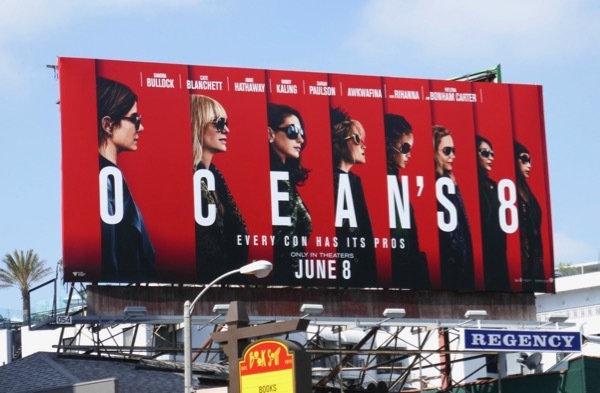 Oscar-winner Sandra Bullock leads a powerhouse all-female cast in the cinematic spin-off to the Ocean's crime caper movies that ran from 2001 to 2007 (that were based on the classic 1960 Rat Pack film). Fresh out of prison 'Debbie Ocean', the estranged sister of 'Danny Ocean', recruits a crew of specialists to steal a necklace worth more than $150 million at New York City's star-studded Met Gala. 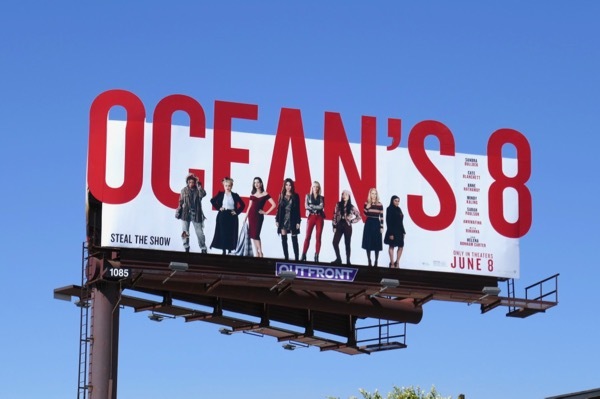 With the help of her partner-in-crime, 'Lou Miller' (Cate Blanchett), she gathers jeweler 'Amita' (Mindy Kaling), street thief 'Constance' (Awkwafina), expert hacker 'Nine Ball' (Rihanna), suburban mom and savvy fence 'Tammy' (Sarah Paulson), fashion designer 'Rose' (Helena Bonham-Carter) and their celebrity actress target, 'Daphne Kluger' (Anne Hathaway). 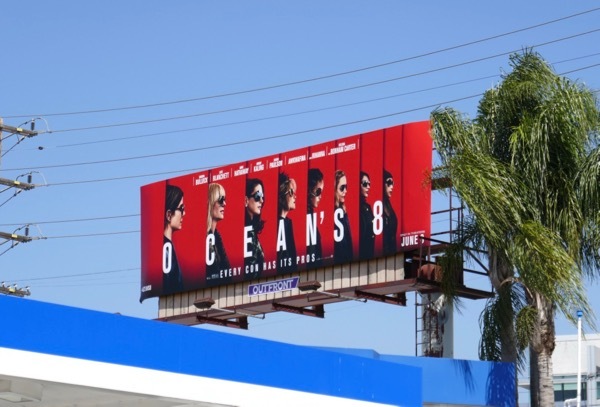 These striking movie billboards were snapped along the Sunset Strip, Beverly Boulevard, Melrose Avenue and Westwood Boulevard from April 21 to May 17, 2018. 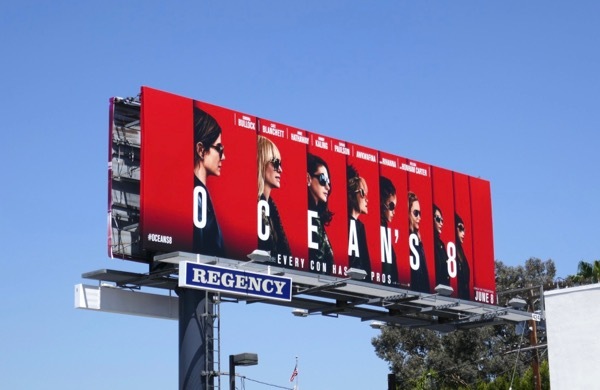 Meanwhile Sandra Bullock fans can check out these Gravity movie billboards, these billboards for The Heat and these Our Brand Is Crisis movie billboards, whilst Cate Blanchett admirers can enjoy this Giorgio Armani Si fragrance billboard and these Thor: Ragnarok movie billboards. 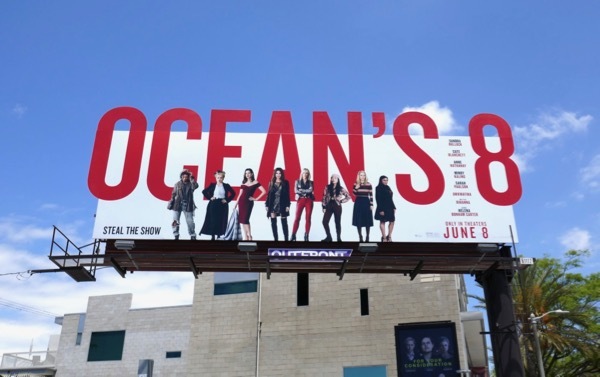 For more of Anne Hathaway you can take a look at these Les Misérables movie billboards and these film billboards for The Intern, plus Mindy Kaling fans can enjoy all these billboards for The Mindy Project. Plus stayed tuned tomorrow for more billboards featuring music icon Rihanna. 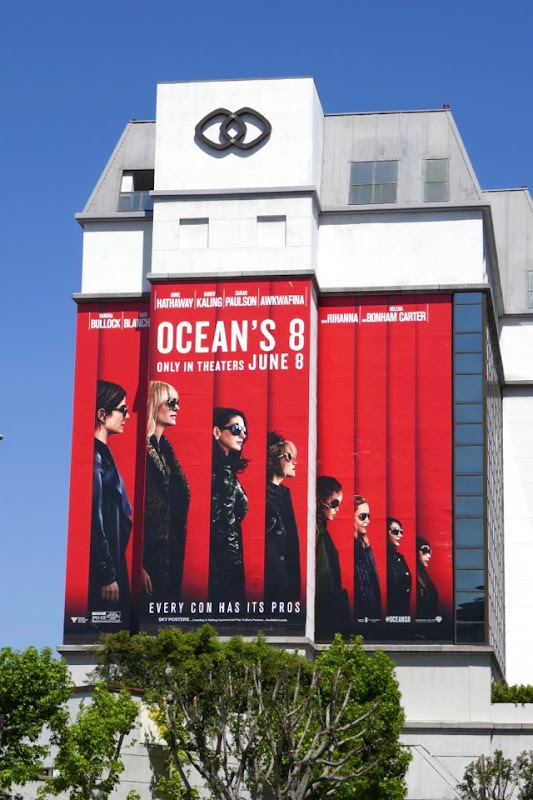 An all-female crew of Ghostbusters didn't set the box office on fire with their proton packs, but can this all-star Ocean's 8 steal the summer with their daring criminal escapades. Synchronise your watches for June 8, 2018. 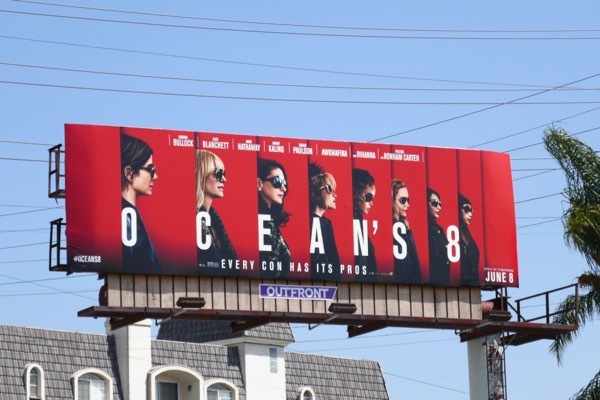 UPDATED: Here's also two examples of a follow-up special extension billboard for the film giving us a clearer look at the shady ladies. 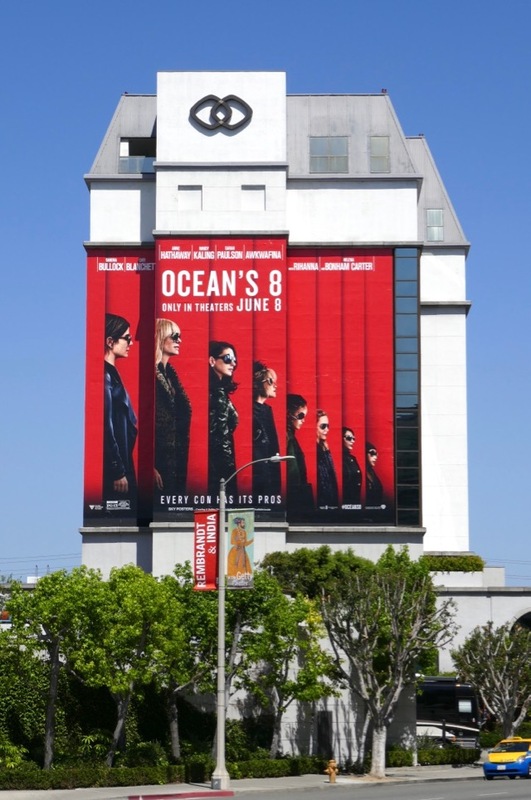 These striking cut-out billboards were snapped along Melrose Avenue and Vine Street on May 25, 2018. They really do steal the spotlight in the city skyline, don't you think. 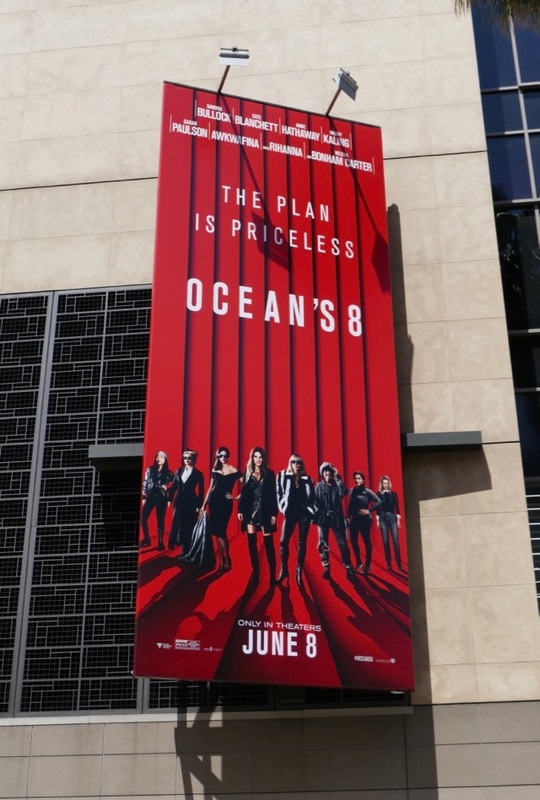 It would be a crime if you didn't go and see it. 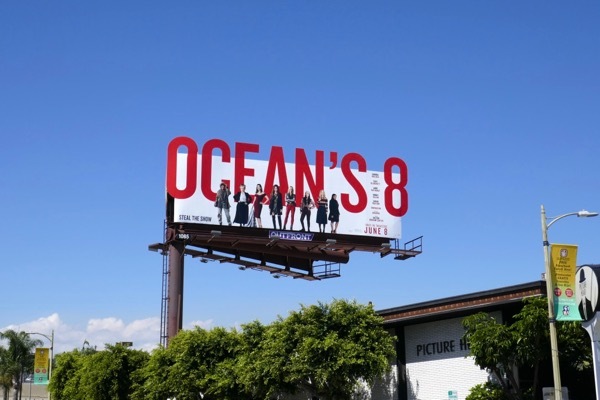 Plus here's a wildposting snapped along Santa Monica Boulevard in West L.A. on May 29, 2018, shining a spotlight on each character. 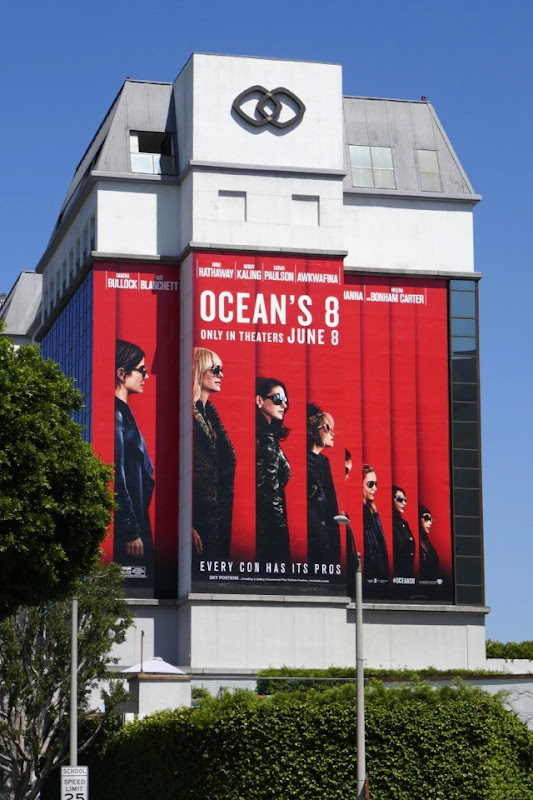 UPDATED: Here's also a portrait billboard creative for the film spotted along Highland Avenue on June 4, 2018.